Woohoo! Another company lunch with too much chicken left over. I was able to take home about a pound's worth of meat and as much again of bone. Truth to tell, I am more interested in the bones than the meat at this point, since I am always looking for scraps for stock. I also scored about 1-1/2 onions, already sliced up, also for stock. I will have to get busy this weekend. What to do with the meat? I thought about making another batch of the chili chicken sauce I made last time I brought the chicken home. That was delicious served over polenta. The only problem is that I already had planned to make my corn casserole, and that is so close to polenta that it didn't make sense to have both at the same time. I didn't see any reason why I couldn't add the chicken to the corn casserole, though, in addition to the baby broccoli I was already planning to add. 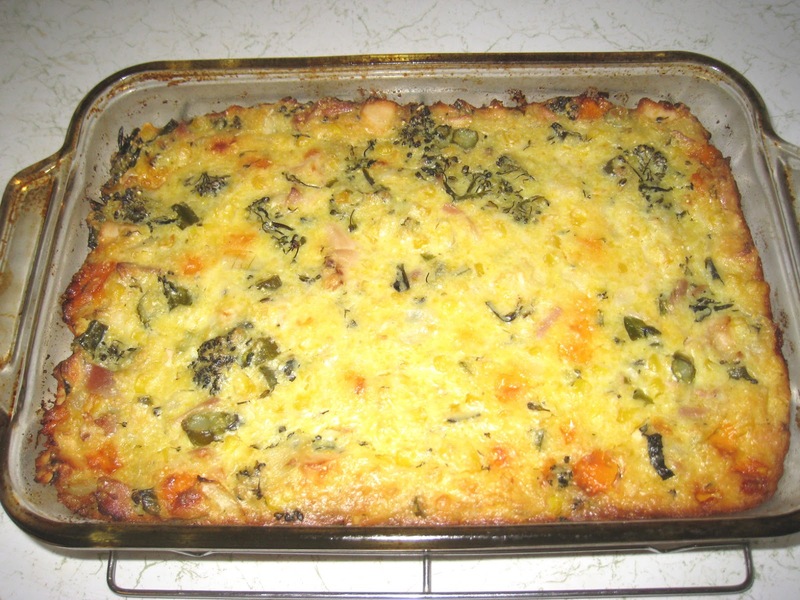 I thought it might come close to a cheesy chicken broccoli casserole my sister used to make, only healthier without the canned cream of mushroom and cream of celery soup that go into that recipe. I was a little worried that it might be too many ingredients for the base cornmeal, egg, butter and yogurt mixture to handle without getting too dry, but I added a little white wine and that seemed to do the trick. 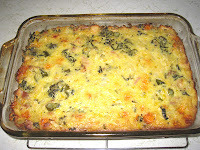 One other change I made - instead of using the can of mild chopped green chilies that usually goes into my corn casserole, I used a pickled jalapeno (and yes, I did pickle it myself - more on that later). I found the jalapenos at the Leaning Shed Farm stall at the Green Market, and they are super hot. So hot that I added a dollop of yogurt to help soothe my palate. It was perfect. Because I added almost twice as much volume to the casserole with the chicken and broccoli, I baked it in an 8 x 11" dish instead of the 1.5-quart round dish I usually use. It was a smart decision. Adding the chicken and broccoli takes this from a great side dish to a satisfactory meal in itself. It's a great way to use up leftover chicken. And it is just as easy to make as the meatless version. Heat the oil over medium-high flame in a large skillet. Add the onion and cook until tender, about 5 minutes. Add the garlic and the broccoli stems and cook until the stems are tender, another 5 minutes. Add the chicken and broccoli florets and season to taste with the salt and pepper. Add the wine and the broth and bring to a boil. Simmer on low heat covered, for 10 minutes. Remove from the heat and let cool while you put together the rest of the dish. Puree the butter, 1 cup of the corn, and the eggs in a blender or food processor. 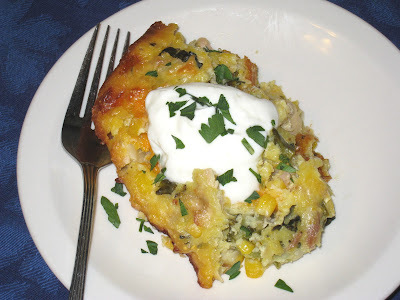 Pour into a bowl and add the yogurt, cornmeal, chilies, cheese, salt and the rest of the corn and stir together. Fold in the cooled chicken and broccoli mixture. Pour into a buttered 9 x 12" baking dish. Bake at 350 deg. F. for about 40 minutes, until the top has set and has just started to brown. Serve garnished with a dollop of yogurt or crema fresca, if desired.